Chapter 4, The Technology of Ideas, is worth the full price for re-introducing so many essential ideas you MUST understand in order to truly understand the dynamics of work culture. Why do we work? The question seems so simple. But Professor Barry Schwartz proves that the answer is surprising, complex, and urgent. We’ve long been taught that the reason we work is primarily for a paycheck. In fact, we’ve shaped much of the infrastructure of our society to accommodate this belief. Then why are so many people dissatisfied with their work, despite healthy compensation? And why do so many people find immense fulfillment and satisfaction through “menial” jobs? 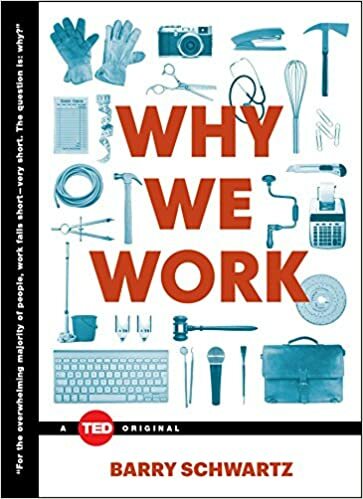 Schwartz explores why so many believe that the goal for working should be to earn money, how we arrived to believe that paying workers more leads to better work, and why this has made our society confused, unhappy, and has established a dangerously misguided system. Through fascinating studies and compelling anecdotes, this book dispels this myth. Schwartz takes us through hospitals and hair salons, auto plants and boardrooms, showing workers in all walks of life, showcasing the trends and patterns that lead to happiness in the workplace. Ultimately, Schwartz proves that the root of what drives us to do good work can rarely be incentivized, and that the cause of bad work is often an attempt to do just that. How did we get to this tangled place? How do we change the way we work? With great insight and wisdom, Schwartz shows us how to take our first steps toward understanding, and empowering us all to find great work. Much has been said about work culture and its myths. So what to expect from the author of The Paradox of Choice: Why More Is Less And How The Culture of Abundance Robs Us of Statisfaction and Practical Wisdom: The Right Way to Do the Right Thing? Why We Work starts plain and familiar – yeah yeah all that motivation and incentive stuff. Duh? But the treasure is not on that level. The treasure is on an even higher level of discussion – about behavioral change and its subtleties, about institutionalization and its hidden traps, about perceptions and self-fulfilling prophecy, about social structures shaped by ideologies in good or bad ways. Through all that we get to know the real and often hidden danger of a work culture. Empathy, and care and concern for the well-being of others, are routine parts of most people’s character. Yet they are in danger of being crowded out by exclusive concern for self-interest- a concern that is encouraged by the incentive-based structure of the workplace. Acts of commitment… occur routinely. They hold society together. But because of the self-fulfilling character of ideology, we should not be sanguine that they will persist. We should not be confident that the distortion that dominates current thinking about work and workers will reveal itself and be corrected as the sciences of human nature progress. Unless there is a collective effort to combat this ideology, we will all become the lazy, selfish pursuers of self-interest, not just in work but in our lives as a whole, that at least some social scientists have assumed we always were. Theories about human nature can actually produce changes in how people behave. What this means is that a theory that is false can become true simply by people believing it’s true. The result is that, instead of good data driving out bad data and theories, bad data change social practices until the data become good data, and the theories are validated. That’s one of my favorite quotes from the book. It really should make us think about what everyone of us could do to facilitate a better work culture. And there’s simply no way that it’s none of your business – once you’re in, there’s no way out (unless you quit).